A magnetic hammer speeds up a project considerably. As you may have noticed a lot of time hammering in nails is wasted lining up and holding the nail straight. The magnetic hammer has a groove in the side of the head which holds the nail in correct alignment, you tap to position the nail into place and then hit. Great in situations like fencing where there is a lot of nailing, or roofing where you can find yourself in awkward positions, or upholstery where you are using little pins are too titchy to hold. As well as holding nails in place the magnetic hammer has other enhancements to make the job easier. Like a rubber hand grip to make it easier to hole and improve grip and handle made from fibreglass that actually absorbs the vibration from your hammer blows. 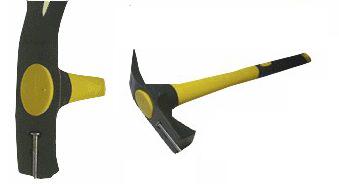 The bright yellow handle makes your hammer easy to identify and spot, even if your project looks like a building site. If that was not enough the magnetic hammer has a 10 year guarantee. Magnetic Hammer text, images and video are copyright.